This article is about the commedia character. For the dove genus, see Columbina (genus). Columbina (in Italian, Colombina, "little dove"; in French, Colombine) is a stock character in the Commedia dell'Arte. 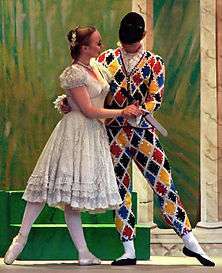 She is Harlequin's mistress, a comic servant playing the tricky slave type, and wife of Pierrot. Rudlin and Crick use the Italian spelling Colombina in Commedia dell'arte: A Handbook for Troupes. 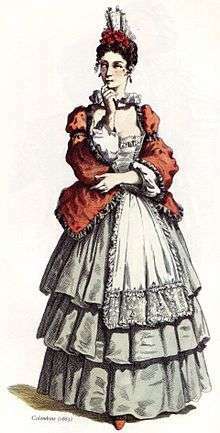 She is dressed in a ragged and patched dress, appropriate to a hired servant. Occasionally, under the name Arlecchina she would wear a motley, similar to her counterpart Arlecchino (Harlequin). She was also known to wear heavy makeup around her eyes and carry a tambourine, which she could use to fend off the amorous advances of Pantalone. "She is very selfish"
She was often the only functional intellect on the stage. Columbina aided her mistress, the innamorata, to gain the affections of her one true love, by manipulating Arlecchino and counter-plotting against Pantalone, while simultaneously managing the whereabouts of the innamorato. She may be a flirtatious and impudent character, indeed a soubrette but without losing her judgment. In the verismo opera Pagliacci by Ruggero Leoncavallo, the head of the troup's wife, Nedda, playing as Colombina, cheats on her husband, Canio, playing as Pagliaccio, both onstage with Arlecchino and offstage with Silvio. Although Columbina became the dominant name (known as Columbine in France and England), other names under which the same character is played in Commidian performances include: fantesca (maid), servetta (female servant), Franceschina, Smeraldina, Oliva, Nespola, Spinetta Ricciolina, Corallina and Diamantina. Chisholm, Hugh, ed. (1911). "Columbine (pantomime)". Encyclopædia Britannica (11th ed.). Cambridge University Press.